The Research Group AGI presents the fifth edition of the Training Seminar ON MEDIATION, a theoretical and practical study program on curatorship addressed to artists, curators, critics, students, researchers, art historians and other collectives interested in the creation of exhibitions beyond disciplinary frameworks. Before the recent professionalization of the figure of the curator, we believe it is necessary to deepen into the notion of contemporary curatorial practices understood as a mediation mechanism, ‘thinking beyond the specialized role’ and creating a space for debate ‘on the cultural location of this mediation’ (Lars Bang Larsen & Soren Andresen, 2006). The ON MEDIATION initiative seeks to respond the need to provide an educational programme from the Academia. This seminar supplies necessary tools for the process of creating an exhibition, which embraces the phases of production, mediation and communication. 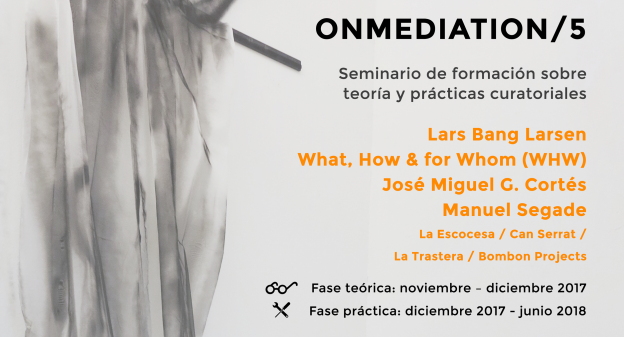 ON MEDIATION/5 Seminar on Curatorial Theories and Practices is a training seminar, where various perspectives are addressed in order to identify different methodologies to promote the curatorial practice towards a multidisciplinary scenario. It is according to this will that we want to provide a space for interdisciplinar dialogue and debate, within the articulation of a twofold programme: on the one hand the theoretical phase, with lectures led by curators of recognized international experience, and on the other hand, the practice phase, where the participants develop an exhibition project through working sessions, which enhance knowledge intertwining and give the chance for shared working processes and mutual decision-making. 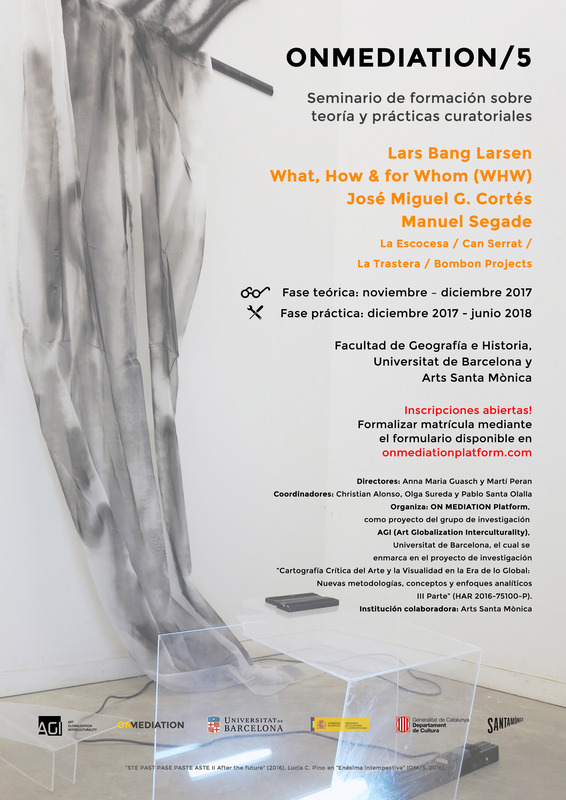 Within the practical phase, the working group will have the opportunity to develop the ideas presented at the seminar by means of the materialization of a supervised curatorial project, which will be presented in June 2018. Organization: ON MEDIATION Platform, a project within the framework of the Research Group AGI (Art Globalization Interculturality), Universitat de Barcelona, and of the Reseach Project “Cartografía Crítica del Arte y la Visualidad en la Era de lo Global: Nuevas metodologías, conceptos y enfoques analíticos II Parte” (HAR 2016-75100-P). November 8th, 18-21h. Faculty of Geography and History, UB. Room 311. November 15th, 11-13h. Faculty of Geography and History, UB. Room 212. November 16th, 18-21h. Faculty of Geography and History, UB. Room 311. November 22th, 18-21h. Faculty of Geography and History, UB. 311. November 23th, 18-21h. Faculty of Geography and History, UB. 311. November 29th, 18-21h. Faculty of Geography and History, UB. 311. December 13th, 18-21h. Faculty of Geography and History, UB. Sala de Juntas. December 20th, 18-21h. Faculty of Geography and History, UB. 311. The theoretical phase has tested different formats of curatorial practices along the various editions of ON MEDIATION. 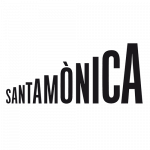 For OM/5 the working group will work in a specific project departing from the repertories of different local contemporary art collections. Beyond the selection of exhibition materials, the above-mentioned project will have to make account of the necessary mechanisms which activate the project itself, emphasizing its historical, esthetic and political potentials. * To formalize the registration for the theoretical phase is mandatory in order to enter into the practical phase. The selection process of the participants which will conform the working team will be announced once the seminar had began. A motivation letter and a CV will be required. Registration fee: 275 € students / 325 € others. Please formalize the registration filling THIS form. Working load: Monitoring, 14 h (December 2017 to June 2018). Overall, at least 40h of collective work are expected.